Japanese studio Suppose Design Office has converted a seafront warehouse in the small seaside town of Onomichi into a specialist cycling centre with a warm and inviting hotel that allows guests to check-in while still on their bikes. 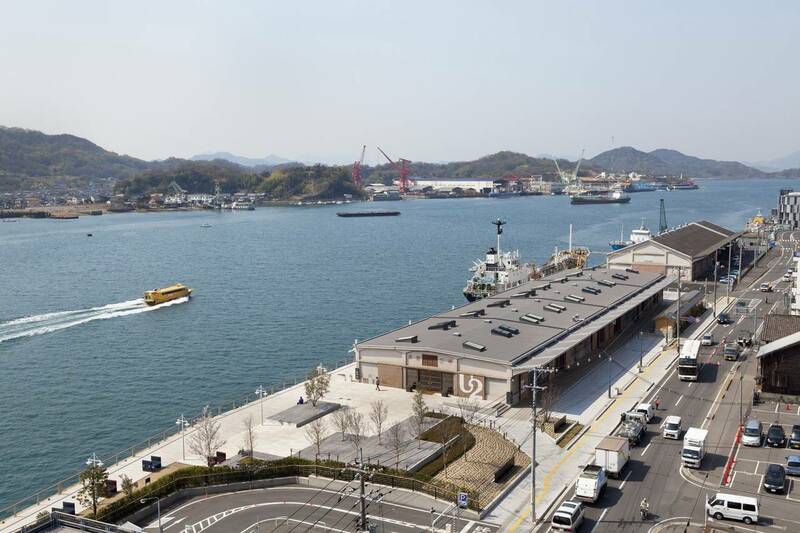 The Onomichi U2 complex is the result of smart and adaptive reuse of an old seaside warehouse into the new interactive space for Onomichi city in the Hiroshima Prefecture of Japan. The complex is dedicated to cycling culture and was created by Suppose Design Office in a renovated warehouse on the edge of the harbour. The complex also includes a boutique hotel, bike shop, a bar and restaurant, and a clothing shop that caters specifically to cyclists. The designers say they "incorporated elements into the re-creation of the seaside warehouse that were reminiscent of the character of Onomichi itself." The building materials—wood, mortar, and steel—have been expertly designed to recall the old houses of Onomichi and the shipbuilding that’s been such a longstanding tradition there. The hotel sits on one end of a central lobby and has 28 rooms split across two levels. A metal-framed staircase leads to the main concourse, while industrial-style light fittings have been installed in the restaurant and bar, both intended to reference the city's shipbuilding history. Bedrooms come with wall hooks that allow guests to store their bicycles when not in use. The hotel is located in Onomichi which is about 1 hour by train from Hiroshima and two hours from Osaka. The reason this hotel exists is mostly due to the famous Shimanami Kaido Cycle Track. It is considered to be the most famous bikeway in all of Japan and it consists of 6 islands and 6 bridges. The Shimanami Kaido begins in Onomichi City. It then heads across the six islands of Mukaishima, Innoshima, Ikuchijima, Omishima, Hakatajima and Oshima, before terminating on the other side in Imabari City. The route was only opened in 1999, so the bridges are modern and attractive. Along the way, riders can enjoy the beautiful scenery of the Seto Inland Sea and the islands' small towns.